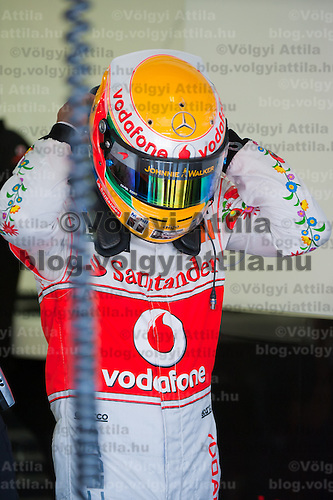 McLaren Formula One driver Lewis Hamilton of Britain wears a Kalocsa design outfit before the free practice of the Hungarian F1 Grand Prix in Mogyorod (about 20km north-east from Budapest), Hungary. Saturday, 30. July 2011. ATTILA VOLGYI.Team sponsor Hugo Boss celebrates its 30th anniversary with special fan made designs for competition saturdays on all races. On Hungaroring the special design is from Hungarian folk tradition with motives from Kalocsa..